The origin of paper dates back to the second century B.C, near Xian, China. It is said that a Buddhist priest of an ancient Korean Kingdom, Goguryeo, introduced papermaking technique to Japan in 610. Paper as well as the techniques were considered valuable back then, did not have much durability. People had improved these delicate papers through years of trial and error, using plant fibers of ganpi tree and species of mulberry known in Japanese as kozo. It was used for transcription of a sutra and in official document in the earliest years, spread among nobles in the Heian period (9th-12th centuries), and expanded its application to architectural field. Later used in sliding doors and even in umbrellas, paper had soon become a part of peoples' lives. Along with Echizen, Mino, and Tosa, Inshu is a region historically known for their hand-made Japanese paper. The name Inshu is the ancient way of calling the eastern region of Tottori prefecture, located at the north of Hiroshima and facing the Sea of Japan. Inshu washi (traditional Japanese paper produced in Inshu area) of Aoya-cho in Tottori prefecture is known as one of the top production areas for Japanese paper. Inshu washi was described in Engishiki; an ancient code of law in the early 10th century; and exclusively restricted to the han (clan) as the finest quality paper of the Edo period. It was designated as the nation's first traditional craftwork in 1975. In Meiji period (mid 19th – early 20th century), paper produced from wood pulp has been brought to Japan, and took over the market share by the end of Taisho period (1920s). Although mass-produced inexpensive paper from the Western world is commonly used in these days, washi also has various advantages. It has the warmness and simplicity synonymous with natural materials, and its biodegradable nature makes it more environmentally friendly. 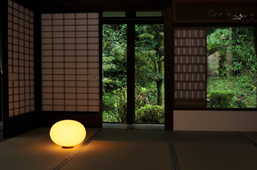 As well as being durable and tough, washi is also finely attuned to its environment, absorbing moisture at times of high humidity and releasing it when the air is dry. It helps keep humidity levels stable making it ideally suited to Japan's humid climate. Long admired and used for a variety of applications in daily life, challenges and collaborative studies are continuing to enhance its functionality. Long and strong fiber, rough texture / used in various situations from sliding doors to artworks. Washi made from plant fibers of ganpi tree, a traditional material for washi. High in durability, works as a natural bug repellent / used in Japanese painting, transcription of a sutra, sliding door, etc. Thin and short fiber, have unique smooth shiny texture. Washi made from the mitsumata shrub, a modern material for washi. Soft gloss, resilient fabric / used in Japanese calligraphy, sliding door, official document, etching, current Japanese large bill, etc. It is said that a categorical distinction between Japanese washi and Western paper is dates only back to the beginning of Meiji period. Washi is the name of Japanese paper made by traditional methods and/or with traditional material. "Wa" was the old name for Japan and is often used in comparison to western items such as "washoku (Japanese food)," "washitsu (Japanese room)" and "washi (Japanese paper)." Paper produced from wood pulp by mass-production is known as "paper / Western paper," and hand-made paper using material such as kozo and mitsumata shrub as "washi / Japanese paper" but strict division between these two is difficult. In addition, with progress in manufacturing process, there now is a mass-made washi, combination of hand/mass-made washi, and traditional hand-made washi. Nowadays, it is considered appropriate to classify by material (bast fiber / wood pulp), length of fiber, whether paste is used or not. Although production of washi paper is delicate and complex, there is no big difference in the basic processes. Here we introduce traditional manufacturing process. Peel off, or husk the outer surface of fiber plant. Wittle, then wash in the river. Repeat several times. Boil up, pour off, and add more water again. Beat in over and over again, and add other material as well. The fiber may also be extracted by pounding with wooden stick or tools. Mix the fibers inside water, using bamboo stick. Rock, or move the net back and forth to evenly entwine the plant fibers. This back-and-forth movement is known as a symbolic gesture of washi making. Take the net out from a larger container, letting very thin fibers to dry out.